My first 5-Star review came in from Readers’ Favorite . Readers’ Favorite is a fastest growing book review and award contest site. They have earned the respect of renowned publishers such as Penguin Random House, Simon & Schuster, and Harper Collins, and have received the “Best Websites for Authors” and “Honoring Excellence” awards from the Association of Independent Authors. It is an honor to recognized as a 5-Star author. And I get to put a sticker on my book! 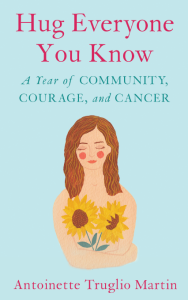 Hug Everyone You Know: A Year of Community, Courage, and Cancer by Antoinette Truglio Martin is a heartwarming memoir that follows a woman’s struggle to cope with breast cancer. Antoinette Martin had always thought she was a healthy and strong woman until the day she was diagnosed with breast cancer. Her world would crumble as she went through the denial phase to sheer stupefaction, through anxiety to embracing the reality. The long hours of waiting at the clinic that seemed like forever, the solitude that enveloped her in the dire hours of the night, and the sense of fear about the painful reality are things that Martin learned to deal with. But how does one wake up from a nightmare like breast cancer? transform it into a life-giving experience. Here is a book that will bring tears to the eyes of readers — tears of pain and empathy, but also tears of joy at contemplating the wellsprings of life that are hidden within us, waiting to burst forth through our experience of pain. Antoinette Truglio Martin writes with natural humor and readers will find a lot of encouragement and hope in her writing.This book will show readers the power of human connectivity and how sharing our experience can become an inspiring journey, not only for those who listen to us, but for us who live it. Hug Everyone You Know: A Year of Community, Courage, and Cancer is a painful and empowering journey, a book that will speak to those undergoing any hopeless situation; it’s a gift to receive, use and pass on. This book will give readers the strength and the inspiration to name their suffering and to triumph over it. It’s exciting, informative and, above all, entertaining. Next postHug Pack-Kits Are Here! Congratulations! May it be one of many.